John Staples is Sales Director with Defense Vision Systems, (DVS) based in East Sussex, UK. Defense Vision Systems is a wholly owned subsidiary of Photonic Science. 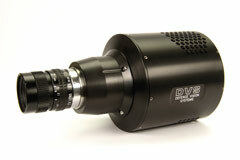 Based in the United Kingdom, DVS designs, develops and manufactures cameras and camera systems for the defense market. DVS cameras are now in service worldwide providing low cost, low maintenance products for both night vision as well as 24 hour use. Q: The modern warfighter uses a variety of technologies for surveillance and target acquisitions, basic optics, nightvision, thermal imaging, etc. While good, each of these technologies has some inherent limitations. Can you elaborate? A: Each type of sensor has limitations, as a few examples performance from a thermal system can be dramatically reduced in rain. Image Intensified vision does not work if there is absolutely no light. Standard CCD systems, if used for long range viewing, suffer from atmospheric aberrations. Q: Which brings us then to the idea of “Multi Spectral Surveillance,” or imaging technologies/devices that combine platforms, and basically can be used “day and night.” Can you tell me about that in general, and what are the challenges in developing such devices? A: The ideal situation is to try and match the sensors for a particular application so that they complement each other and provide the optimum image over the selected waveband. The problem is to do this in the most cost-effective manner and as well as providing the user with a sensible image. To use a thermal system with a visible band system will involve two separate optical systems. Hence increase in size, weight and maintenance complexity. The problem is to do this and keep these problems to a minimum. All users are keen to reduce size, reduce weight and reduce power. The other problem is presentation of the image, as the two bands are complementary then do you present the image as two images or as an overlaid or merged image? The former is simple whereas the latter involves further software etc. Q: Specifically, and without revealing anything proprietary of course, tell me about the Surveillance Target Acquisition System Multi-Spectral device (STAS24) recently developed by Defense Vision System? A: The DVS STAS24 makes use of the visible band wavelength 400 to 900nm and the near infrared waveband 900 to 1700nm. We exploit the fact that glass is able to pass energy over the range 400 to 1700nm and use a single common objective lens. We then pass the relevant waveband to the visible sensor and the other to a SWIR sensor. These images are then combined at pixel level and the merged image provided to the user via a small screen and eyepiece. DVS High Resolution ICCD. Photo © DVS. Included in the package is a 8Km 1550nm laser range finder and the spot this places on the target is visible to the user in the combined image. The spot is artificially coloured red to enhance it against the background. The unit includes a GPS and electronic compass. The information on range, location of user and heading are all displayed on the screen together with the merged image. We are also in the midst of developing a 1550nm illuminator for an alternative version of this system. 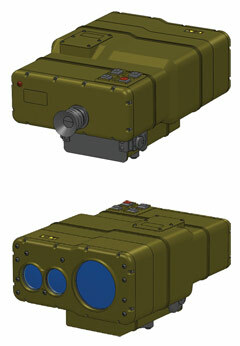 The illuminator will replace the laser range finder in this version of the viewer. Q: Within what you are at liberty to disclose, can you give me a typical “real world” scenario of where and how STAS24 is being/can be used? A: The system is used to find and then identify the target over the light range of full sun to starlight. It can then find the range to the target, the position of the team using the viewer, and the heading to the target from the user’s position. This data would then be used to generate a firing solution. The big edge the viewer provides is by providing the ability to see the laser spot on the target. This provides the certain knowledge that the range provided is actually on the selected target and not on a tree or other object situated near the target. Q: As I understand it, the system is currently designed to be mounted on airborne or land armored assets. Are there any plans to adapt the technology to “man portable” use? A: Actually, as currently built it is man portable, very similar in size and weight to common in use longer range laser systems. The other applications will follow from the man portable version. Q: As you see it what are the greatest challenges facing the military currently relating to ISR and Target Acquisition, and what is Defense Vision Systems doing to surmount those challenges? A: As always, size, weight and power are our greatest challenges. There is an ever increasing amount of technology the dismounted soldier is having to carry. Every electronic device requires a battery this will require charging or replacing at regular intervals. So we are always looking to reduce weight, size, and power consumption. In addition everybody is looking to see what can be integrated with what! Mobile phones carry a large amount of integration and there is no reason why this cannot be carried forward into specific defense equipment. Q: Do you provide your imaging solutions under contract, or COTS, or both? If contract, are there any current or recent awards you would care to discuss? A: DVS has worked with both COTS sales as well as contract developments. Due to contract conditions we are not allowed to specify customers, but these have included most of the larger US defense companies situated in the USA, Canada and UK, plus many of the continental larger defense contractors. However the STAS24 and it’s variants will be aimed at the end user. Q: What is it that is unique about STAS24 and your other imaging solutions? What is it that separates you from your competitors? A: The STAS24 big difference is it is the first laser system that provides the certain knowledge that the range derived is that to the target. No assumptions that the range provided is to the target. DVS is able to work in all of the wavelength ranges from 400nm to 14,000nm. We are able to provide multi-wavelength systems offering merged images and all of the engineering to make this happen is under one roof. In addition, being a private company we can make very fast decisions in regard to developing a device or system. We pride ourselves on no shareholder delays. Q: Without revealing anything proprietary, what do you think is next in Tactical ISR in general, and specifically for Defense Vision Systems as it relates to meeting the needs of ground forces? A: We foresee more requirements for policing type and covert surveillance only operations. These will require very simple systems to upload the information to base commanders or even politicians. Therefore DVS is developing a body mounted surveillance system using visible combined with near infrared. The system will include the ability to easily upload the images to the internet via Wifi or 3g or 4g. These images will be encrypted and then can be downloaded more or less anywhere in the world.